We’d love your help. 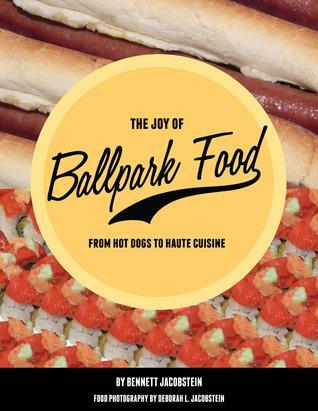 Let us know what’s wrong with this preview of The Joy Of Ballpark Food by Bennett Jacobstein. From the early part of the twentieth century until the 1980s, classic baseball fare consisted mostly of hot dogs, ice cream, peanuts, and Cracker Jack. Then Baseball is a game that is identified with food. We even sing about it at every ballpark during the seventh inning stretch: “….buy me some peanuts and Cracker Jack…” The famous song was written by Jack Norworth in 1908. To ask other readers questions about The Joy Of Ballpark Food, please sign up. Anyway, baseball is a sport that is loved by so many, and food, well, who doesn’t love food? This book b I have so many good memories of going to see the Cinncinnati Reds play when I was a kid and living in Columbus, Ohio. My brother in law would take all of to see the games and we loved it. This book brought back a lot of memories. The only ballpark I’ve ever been to is Riverfront Stadium, which was finished in 1970. The name was changed to Cinergy Field in 1996 and was sadly demolished in 2002. People are often surprised to learn that I adore baseball. I grew up with my dad taking me to White Sox games in Chicago, so for me baseball is something that's nostalgic and synonymous with summer vacations. There's nothing like the smell of popcorn, the buzz of the crowd, and the fireworks in the night sky after a victory. On top of that, my dad is a chef, so food has always a prominent role in my life. When I found a book that combined the two- baseball and food, I had to have it. And I'm gla People are often surprised to learn that I adore baseball. I grew up with my dad taking me to White Sox games in Chicago, so for me baseball is something that's nostalgic and synonymous with summer vacations. There's nothing like the smell of popcorn, the buzz of the crowd, and the fireworks in the night sky after a victory. On top of that, my dad is a chef, so food has always a prominent role in my life. When I found a book that combined the two- baseball and food, I had to have it. And I'm glad I gave it a go! Baseball is synonymous with summer. People all over our country spend days, nights and weekends at ballparks cheering on their favorite minor or major league teams. Part of that enjoyment includes the food you eat at the game. Ballparks aren't just serving hot dogs, peanuts, and cracker jacks anymore. There are foods to cater to every palate as well as dietary needs. Bennett Jacobstein and his wife, Dorothy spent a good share of 2014 visiting all thirty of the major league ballparks in the Unite Baseball is synonymous with summer. People all over our country spend days, nights and weekends at ballparks cheering on their favorite minor or major league teams. Part of that enjoyment includes the food you eat at the game. Ballparks aren't just serving hot dogs, peanuts, and cracker jacks anymore. There are foods to cater to every palate as well as dietary needs. Bennett Jacobstein and his wife, Dorothy spent a good share of 2014 visiting all thirty of the major league ballparks in the United States. Their purpose was to investigate the various food offerings and find out what is unique about each one. Their book also shares iconic historical information related to the classic song, "Take Me Out to the Ball Game", the creation of Cracker Jacks, hot dogs, nachos, and how peanuts became a top-selling item at ball games. Each ballpark is featured including their signature hot dog and some of the more "unusual" and popular food choices. Dishes such as Grilled Wild Alaskan Salmon at Safeco Field in Seattle, Wild Rice Soup at Target Field in Minneapolis, Rocky Mountain Oysters at Coors Field in Denver, and a Lobster Roll at Fenway Park in Boston are just a few of the stranger options to enjoy during a ball game. 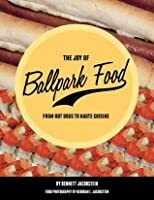 The enjoyment of food during a ball game has become big business and the Jacobsteins' share some interesting tidbits of baseball history, how some foods were created, and unique hot dogs to fit every personality and geographic location. Wonderful photos are included throughout the pages to whet your appetite. After reading through these pages, you will want to order tickets to get to your favorite ballpark as soon as you can! Our family has only been to four of the ballparks, and were familiar with several of the dishes mentioned at Wrigley and PNC Park. This book can certainly be used as a travelogue to visiting and tasting some of the chef-inspired dishes that have become so popular at games. Even though this book is offered in paperback form, it would make a great coffee-table book or conversation starter for summer gatherings or an excellent gift for that baseball fan in your life. Even non-fans will enjoy the food facts throughout the pages. The best part is that all royalties from the sale of this book will be donated to Second Harvest Food Bank. That makes this book a "Home Run"! WOW! Informative and educational. Filled with information on concession stands, hot dogs, food at ballparks, ballparks, baseball and so much more. Simply delicious from the first page to the last. A culinary tour with absolutely no weight gain. No recipes are involved, but many of impressive pictures are depicted. A wonderful food-baseball connection with pictures and history. Baseball and food what could be better! Fans of baseball, history, food connections, and educational books, as well as i WOW! Informative and educational. Filled with information on concession stands, hot dogs, food at ballparks, ballparks, baseball and so much more. Simply delicious from the first page to the last. A culinary tour with absolutely no weight gain. No recipes are involved, but many of impressive pictures are depicted. A wonderful food-baseball connection with pictures and history. Baseball and food what could be better! Fans of baseball, history, food connections, and educational books, as well as informational books, will enjoy this marvelous book. An awesome book for any library, including, school libraries. Well done! Strongly recommended! Bennett Jacobstein lives in San Jose, CA. He is a retired librarian and publisher of demographic materials. He currently works during the baseball season in the concessions stand at Municipal Stadium, home of Minor League Baseball’s Class A Advanced San Jose Giants. Every minor leaguer dreams of making it to the big leagues. Bennett had his dream fulfilled when he worked as a concessions stand sub Bennett Jacobstein lives in San Jose, CA. He is a retired librarian and publisher of demographic materials. He currently works during the baseball season in the concessions stand at Municipal Stadium, home of Minor League Baseball’s Class A Advanced San Jose Giants. Every minor leaguer dreams of making it to the big leagues. Bennett had his dream fulfilled when he worked as a concessions stand substitute at three Oakland Athletics games during the 2013 season. He enjoys both baseball and food but considers himself a much better eater than ball player. He had a two-year Little League career in which he went two seasons without getting a hit. His only RBI was when he got hit by the pitch with the bases loaded. When not batting or sitting on the bench, he would be found in right field praying that the ball didn’t get hit to him. The three greatest days of his life were the day he married his wife Debbie, the day his daughter Aviva was born, and the day he first successfully replaced the nachos cheese bag in the dispenser at the San Jose Giants’ concessions stand.